This is was one of our Friday dinner menus, a while ago now. We were in a celebratory mood but wanted to keep things simple at the same time. As my wife was setting up the candle and the red wine, I quickly went into action and made some pasta, sautéed asparagus and tomato mozzarella salad, and some fresh Italian bread to go with it. The dinner ended up being fantastic. Sometimes such quick turnaround preparations can turn out to be so delicious. So let’s go straight to the recipe. 1. Clean the asparagus, and cut off the hard part, around 1 inch from the end. Cut the remaining asparagus into 1 ½ inch length pieces. Set aside. Cut the garlic horizontally into thin slices. 2. In a wok or a frying pan, add oil and keep the flame on medium heat. Add the garlic and stir until the garlic starts to turn golden brown. Add the asparagus, salt and pepper to taste and mix everything together. 3. Asparagus cooks very quickly. Turn off the fire the moment the asparagus is crunchy and juicy, but cooked. 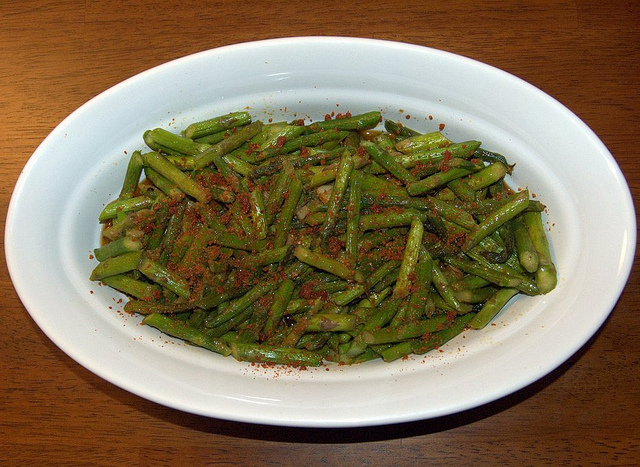 Transfer the asparagus to a serving dish. Sprinkle dry garlic chutney powder on top if you like a blast of spice and garlic. You can buy this chutney powder from any Indian store. It is totally optional. 1. Fresh mozzarella is usually sold in the shape of a ball. Cut the mozzarella into 1/8 inch thick slices. Do the same with the plum tomatoes. 2. You can mince the garlic. Or, you can grate the garlic. Slice the basil leaves into thin slices lengthwise. 3. Set the mozzarella and tomatoes on a serving plate, one slice on top of another. 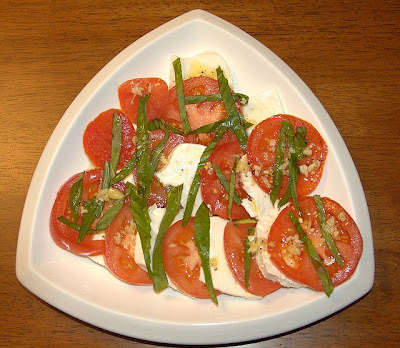 Grate the garlic on top of the cheese and tomato, and garnish with the basil leaves. Drizzle the olive oil on top of this, and sprinkle salt and pepper to taste. 1. In a large soup bowl or something similar, bring 5 cups of water to boil. When the water is boiling, add the penne pasta to it, and throw in some salt. 2. Boil for around 8-10 minutes, and turn off the flame when the penne is cooked al dente or just ready to eat. It will be a little crunchy, hence if you prefer a well done pasta, boil until it is cooked to the consistency you like. 3. Drain off the water completely, shaking off any excess. Add the cooked pasta to a plate, drizzle ½ tbsp of extra virgin olive oil, and garnish with basil leaves. 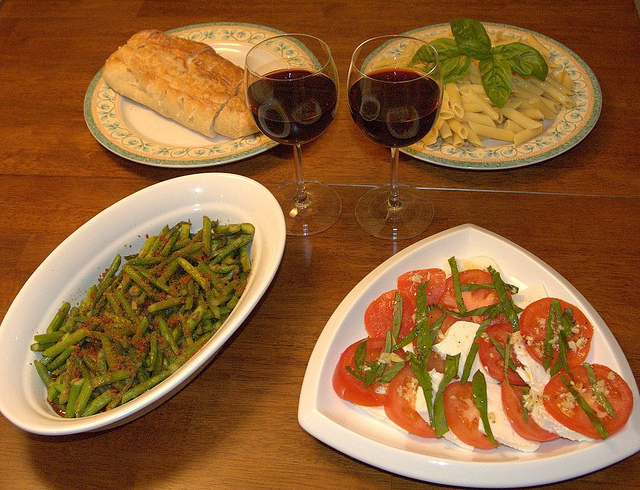 You can serve the penne with the asparagus (tossing them together) of if you prefer to add sauce to it, you can do that as well. Serve with a nice red wine.